I have been in your shoes! Going through the process of selling a home is what sparked my interest in home staging. Now, I am passionate to share my expertise to help you through the home selling process! I’m happy I have realized my passion and can help others avoid the frustrations of selling a home. I listen to homeowners, I know how they feel, and have a sincere desire to help. 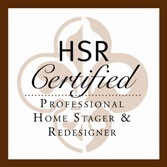 I am an HSR Certified Professional Home Stager and Redesigner and have completed the most comprehensive home staging and redesign certification course in the country provided by the Home Staging Resource. The HSR Certification program is accredited by the Real Estate Staging Association (RESA), who is the only third-party, governing association for the home staging industry. The Home Staging Resource is the first and one of the only accredited staging training courses available for the staging industry. I am a member of the American Society of Home Stagers & Redesigners (ASHSR) and am a Real Estate Staging Association Pro (RESA Pro). I was named one of RESA’s Top Ten Rising Star Professional Stagers for 2014 and have received the “Best of Houzz” for Customer Service for the past 4 years. Since starting my business in 2012; not only am I passionate about staging to help clients sell, but also about the staging industry as a whole. I encourage and help new stagers in the Columbus area and educate agents and homeowner alike. I am an HSR Staging Mentor for Columbus and surrounding areas, am the current President of the Real Estate Staging Association (RESA) Columbus Chapter and teach classes to homeowners about home staging at the Dublin Community Recreation Center.